1 God Save The Queen is the official national anthem but it is generally used only on regal and vice-regal occasions. Antigua and Barbuda is a three-island nation located in the eastern Caribbean Sea on the boundary with the Atlantic Ocean. The area of Antigua and Barbuda is 171 square miles (442 square kilometers), two and a half times the size of Washington, D.C.. The islands' indigenous people became virtually extinct not long after European settlers and African slaves descended upon the islands. Their demise is believed to have been due to the combined effects of disease, malnutrition, and slavery. Antigua and Barbuda was colonized by the British in 1632 and endured slavery through the years of sugar plantations. Slavery was abolished in 1834, but the lack of an appropriate transition program left former slaves impoverished. Most continued to work on the sugar plantations, where conditions and wages kept them dependent on their former masters. The nation received its independence from Great Britain in 1981. A unique Creole culture exists here, the result of the intermingling of cultures brought by African slaves, Portuguese servants and British settlers. The islands are small and mostly flat with abundant bays and white-sandy beaches. Tourism is the major source of Antigua and Barbuda’s economy. Antigua’s hotels are spread out along its sandy beaches. The most popular bays are Dickenson Bay and Runaway Bay, but remote resorts can be found scattered around the island. Most tourists are from North America and Europe. Antigua and Barbuda is part of the Commonwealth of Nations and its currency is the East Caribbean Dollar. Antigua, Barbuda, and Redonda make up a three-island nation located in the eastern arc of the Lesser Antilles in the Caribbean Sea, 692 kilometers (430 miles) off the coast of Venezuela. It is roughly 17 degrees north of the equator. Its neighbors are Montserrat (UK) and Guadeloupe (Fr.) to the south, Saint Kitts and Nevis to the west, and Anguilla (UK) to the northwest. Antigua is the largest of the Leeward Islands with an area of 280 square kilometers (108 square miles). It is about two-thirds the size of New York City, or seven-eighths the area of Inner London. About 40 kilometers (25 miles) northeast of Antigua lies Barbuda, with an area of 161 square kilometers (62 square miles). Forty kilometers (25 miles) southwest of Antigua lies Redonda, the smallest of the three islands, with an area of 1.6 square kilometers (0.6 square miles). 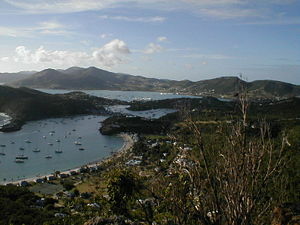 The capital of Antigua and Barbuda is St. John's located at St. John's Harbour on the northwest coast of Antigua. The principal city of Barbuda is Codrington, located in Codrington Lagoon. Redonda is inhabited. 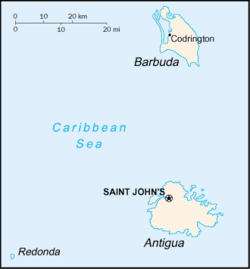 Map of Antigua and Barbuda. 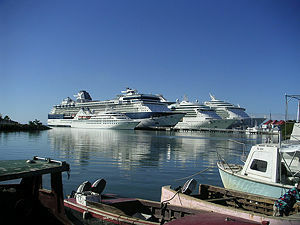 Antigua's shoreline has many bays and harbors. Barbuda has one very large harbor on the west side of the island. The coastline of Antigua and Barbuda is 153 kilometers (95 miles) long. The highest point in the nation is Boggy Peak, at 402 meters (1,319 feet). Antigua and Barbuda are low islands whose landscape is composed of limestone and coral with some volcanic formations and tropical vegetation. They have been worn mostly flat by the wind and rain. The island's white-sand beaches are famous. Redonda, on the other hand, is barren and rocky. The climate is warm and tropical. It is tempered by sea breezes and the trade winds. There is little variation in temperature throughout the year. The average temperature ranges between 27 and 33 degrees Celsius (81 and 93 degrees Fahrenheit). Rainfall is very light. Both islands lack adequate amounts of fresh groundwater. Hurricanes and tropical storms strike the island between July and October, sometimes causing damaging floods. Antigua and Barbuda were largely deforested to make room for sugarcane plantations. The national plant is the West Indian Dagger Log. It has been used for many purposes through the years, from fiber for ropes to medicine for tuberculosis. The national bird is the Frigate Bird, which grows as large as 1.4 kilograms (3 pounds) with a wingspan of up to 2.4 meters (8 feet). Barbuda has the largest bird sanctuary in the Caribbean housing over 170 different species. The national animal is the fallow deer, originally brought from Europe. The national sea creature is the hawksbill turtle. Antigua has one of the rarest snakes in the world, the Antigua Racer Snake. Antigua was first settled by pre-agricultural Amerindians known as "Archaic People," (although they are commonly, but erroneously known in Antigua as Siboney, a pre-ceramic Cuban people). The earliest settlements on the island date to 2900 B.C.E. They were succeeded by ceramic-using agriculturalist Saladoid people who migrated up the island chain from Venezuela. They were later replaced by Arawakan speakers, and around 1500 by Island Caribs. They lived throughout the Caribbean, subsisting on shellfish and fish. Little is known about them, but artifacts such as jewelry and tools of stone and shell have been found at different archeological sites in the islands. The Arawaks were the first well-documented group of Antiguans. They are believed to have originated in what is now Venezuela during the early decades of the first century. An agricultural people, they cultivated cotton, indigo, sweet potatoes, beans, corn, and pineapple. The bulk of the Arawaks left Antigua about 1100 C.E. Those who remained were subsequently raided by the Caribs. It is believed that the Carib's superior weapons and seafaring prowess allowed them to defeat most Arawaks in the West Indies, enslaving some and cannibalizing others. With the arrival of Europeans, the indigenous populations declined. European and African diseases, malnutrition, and slavery eventually destroyed the vast majority of the Caribbean's native population. No researcher has conclusively proven any of these causes as the real reason for the destruction of West Indian natives. In fact, some historians believe that the psychological stress of slavery may also have played a part in the massive number of native deaths while in servitude. Others believe that the reportedly abundant, but starchy, low-protein diet may have contributed to severe malnutrition of the "Indians" who were used to a diet fortified with protein from sea-life. The Indigenous West Indians made excellent sea vessels that they used to sail the Atlantic and Caribbean. As a result, Caribs and Arawaks populated much of South America and the Caribbean Islands. Relatives of the Antiguan Arawaks and Caribs still live in various countries in South America, notably Brazil, Venezuela, and Colombia. Christopher Columbus discovered the islands on his second voyage to the Americas in 1493. He did not settle on either of the two islands because of the scarcity of available fresh water and aggressiveness of the Caribs. Nevertheless, he named the larger island "Santa Maria de la Antigua" after a church in Seville where it is said that he prayed before departure. After intermittent Spanish and French attempts to settle the islands, the British colonized Antigua in 1632, with Thomas Warner from Saint Kitts as the first leader and governor. Settlers produced cash crops of tobacco, indigo, ginger, and sugar. In 1666, the French occupied Antigua for eight months until it was given back to the British in the Treaty of Breda. The other islands changed hands many times, but Antigua remained British from that time on. Sir Christopher Codrington established "Betty’s Hope" in 1674, Antigua and Barbuda’s first full-scale sugar plantation. His success prompted other planters to switch from tobacco to sugar. This resulted in a huge increase of slaves to work in the sugarcane fields. By the mid-eighteenth century, Antigua, which has consistently had more economic activity and a larger population than Barbuda, was the site of 150 sugar cane mills, an astonishing number for such a small island. Settlers treated slaves brutally. In the early eighteenth century a slave named Prince Klaas, together with other slaves, planned a rebellion to massacre all white people present on the island, but their plot was discovered ahead of time, resulting in the death of every rebel involved, through torture. During the eighteenth century, Antigua was used as the headquarters of the British Royal Navy Caribbean fleet. English Dockyard, as it came to be called, a sheltered and well-protected deepwater port, was the main base and facilities there were greatly expanded during the later 18th century. Admiral Lord Horatio Nelson commanded the British fleet for much of this time, and made himself unpopular with local merchants by enforcing the Navigation Act, a British ruling that only British-registered ships could trade with British colonies. As the United States was no longer a British colony, the act posed a problem for merchants, who depended on trade with the fledgling country. With all others in the British Empire, Antiguan slaves were emancipated in 1834, but remained economically dependent upon the plantation owners. The freed slaves had little opportunity in sustaining themselves independently because of the limited availability of farming land, therefore many had to rely on poorly paid intensive labor from a few sugar holdings that remained in operation. There were not credit opportunities for the former slaves and their descendants. The islands remained economically underdeveloped and overwhelmingly dependent on agriculture well into the 20th century. The lack of enough farmland for all the people, which became more severe as the population multiplied, induced the islanders to construct shantytowns and attempt to provide for their families as occasional laborers. Some shantytowns are still visible on the outskirts of the capital, Saint John's. Poor labor conditions persisted until 1939 when a member of a royal commission urged the formation of a trade union movement. The Antigua Trades and Labour Union, formed shortly afterward, became the political vehicle for Vere Cornwall Bird who became the union's president in 1943. The Antigua Labour Party (ALP), formed by Bird and other trade unionists, first ran candidates in the 1946 elections and became the majority party in 1951 beginning a long history of electoral victories. In 1970 there emerged a rival political party, called Progressive Labour Movement (PLM), led by George Walter. PLM defeated ALP in the 1971 elections. Therefore, Walter replaced Bird in leadership for a few years until 1976. In the 1976 elections, Vere Bird retook power. In 1978, Bird's ALP government announced the intention to seek full independence from Great Britain. Antigua and Barbuda received complete national sovereignty on November 1, 1981, becoming the nation of Antigua and Barbuda. It remained part of the Commonwealth of Nations and a constitutional monarchy with Queen Elizabeth II as Queen of Antigua and Barbuda. Vere Bird became Antigua and Barbuda first Prime Minister and his political party, ALP, continuously won successive elections. Vere Bird succeeded his power to his son, Lester Bird, who governed from 1994 to 2004. The government of Antigua and Barbuda is a parliamentary democracy. The prime minister is the head of government, the leader of the majority party in parliament, and authorized to conduct all affairs of state in conjunction with the cabinet. Elections must be held at least every five years. Queen Elizabeth II is technically the head of state, but serves only as a figurehead with no substantive power. The queen is represented by a governor general. Antigua and Barbuda has a bicameral legislature. It consists of the House of Representatives (17 seats, members are elected by proportional representation to serve for five years) and the Senate ( 17 members, ten are recommended by the prime minister, four by the opposition leader, one additional on the advice of the prime minister with the condition that he or she is a Barbudan, one chosen by the Barbudan Council, and one picked directly by the governor general from the ranks of citizens. Antigua and Barbuda is a member of the Eastern Caribbean Supreme Court system. Jurisprudence is based on English common law. In 2005, the Trinidad-based Caribbean Court of Justice (CCP) replaced the United-Kingdom Privy Council as the court of appeals. There is also an Eastern Caribbean Supreme Court (based in Saint Lucia); one judge of the Supreme Court is a resident of Antigua and Barbuda and presides over the Court of Summary Jurisdiction. Antigua Labor Party or ALP (Lester Bryant BIRD). Barbuda People's Movement or BPM (Thomas H. FRANK). United Progressive Party or UPP (Baldwin SPENCER), a coalition of three opposition parties—United National Democratic Party or UNDP, Antigua Caribbean Liberation Movement or ACLM, and Progressive Labor Movement or PLM. Antigua and Barbuda's primary diplomatic relations are with other Caribbean countries (Caricom), the United States, Great Britain, and Canada. Firmly anticommunist, Antigua and Barbuda in 1987 was considered to be one of the most ardent supporters of the United States in the Caribbean area. Various forms of United States aid were important to the nation, as was North American tourism. Of importance to the U.S. was the fact that Antigua occupied a strategic position and hosted a United States military presence, including air force and naval facilities. After Antigua and Barbuda gained independence, the United States consulate that had been established in 1980 was upgraded to an embassy in 1982, with a staff of 18. The embassies of China and Venezuela are also present. Norway, Denmark, Italy, France, and Germany are represented with consulates. In May 1997, Prime Minister Bird joined 14 other Caribbean leaders and US President Bill Clinton for the first-ever U.S.-regional summit in Bridgetown, Barbados. The summit strengthened the basis for regional cooperation on justice and counter-narcotics issues, finance and development, and trade. Antigua and Barbuda is a member of, among other international organizations, the Commonwealth of Nations, the International Monetary Fund, the World Bank, the United Nations (UN) and several UN agencies (including the United Nations Education, Science, and Culture Organization), the OECS, the Regional Security System (RSS), Caricom, and the Organization of American States. As a member of Caricom and the Commonwealth of Nations, Antigua and Barbuda supports Eastern Caribbean integration efforts. 1st Battalion, Antigua and Barbuda Regiment—this is the infantry unit and fighting arm of the defense force. Service and Support Unit—established in 1997, this provides administrative, logistic and engineer support to the rest of the defense force. Flotilla—the flotilla is the operational part of the Coast Guard, and consists of four vessels. The RABDF has responsibility for several different roles: Internal security, prevention of drug smuggling, the protection and support of fishing rights, prevention of marine pollution, search and rescue, ceremonial duties, assistance to government programs, provision of relief during natural disasters, assistance in the maintenance of essential services and support of the police in maintaining law and order. The RABDF is one of the world's smallest militaries, consisting of 170 people. It is thus much better equipped for fulfilling its civil roles as opposed to providing a deterrence against would-be aggressors or in defending the nation during a war. In the twentieth century, tourism took the place of the sugarcane industry as the principal means of income for Antigua and Barbuda’s economy, and it is the main source of employment for those living on the island. Most tourists come from the United States, but also Canada and other European and countries. Agriculture is also important to Antigua and Barbuda’s economy, and it is primarily focused on the domestic market rather than the export of goods. The agricultural production consists of fruits and vegetables, (bananas, mangoes, coconuts), sugarcane, cotton, and livestock. Approximately 82 percent of the island’s workforce works in commerce and service while 11 percent works in agriculture. The rest of the workforce is employed by the government. The economy has become gradually more diversified, so it will not be vulnerable to forces such as hurricanes and violent storms. In recent years, Antigua and Barbuda has had a construction boom in hotels and housing, as well as in projects related to the 2007 Cricket World Cup. It has encouraged growth in transportation, communications, Internet gambling, and financial services. Antigua and Barbuda's currency is the Eastern Caribbean Dollar (EC$), a regional currency shared among members of the Eastern Caribbean Currency Union (ECCU). The Eastern Caribbean Central Bank (ECCB) issues the EC$, manages monetary policy, and regulates and supervises commercial banking activities in its member countries. The ECCB has kept the EC$ pegged at EC$2.7=U.S. $1. Antiguans and Barbudans are predominantly of African or mixed African ancestry, the descendants of slaves brought to the islands by British colonial sugar planters. There is a presence of Portuguese or mixed African-Portuguese who were brought to the islands to work as indentured servants. There are also Europeans principally of English and Irish descent, Arabs from Lebanon and Syria, and Chinese. The majority of the country's inhabitants live in Antigua. In the capital city, Saint John's, live approximately 30,000 people. The rest of Antigua's population is largely rural. Barbuda has only about 1,200 inhabitants, almost all of them living in the village of Codrington. Redonda is inhabited. There is a large percentage of the population who live abroad mainly in the United States, Canada, and England. A few of the Antiguan residents are immigrants from the United States, Dominica, Guyana, and Jamaica. In terms of religion, the people are predominantly Christian, and reflecting the long period of British influence, Anglicanism is the most widely practiced denomination. The official language is English, but many of the people speak a dialect combining English with West African and Romance language elements, known as Lesser Antilles patois. Ninety percent of the population is literate. In 1998, Antigua adopted a national mandate to become the preeminent provider of medical services in the Caribbean. As part of this mission, Antigua is building the most technologically advanced hospital in the Caribbean, the Mt. St. John Medical Centre. The island of Antigua currently has two medical schools: American University of Antigua College of Medicine (AUA), founded in 2004 and The University of Health Sciences Antigua (UHSA), founded in 1982. There is also a government–owned state college in Antigua as well as the Antigua and Barbuda Institute of Information Technology (ABIIT). 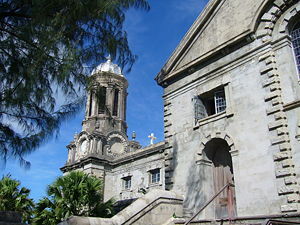 The University of the West Indies has a branch in Antigua for locals to continue University studies. Antigua and Barbuda retains a traditional West Indian character with a strong British stamp. It is manifested in the gingerbread architecture found around the capital, the popularity of steel-band, calypso and reggae music, and in festivities, such as Carnival. English tradition also plays an important role, as it is evident in the national sport, cricket. Cricket is popular and played everywhere by all ages. National and international games are played at the Antiguan Recreation Ground in St. John's. Viv Richards (King Viv or the 'Master Blaster' as he was known) is one of the must famous cricketers in the modern game. A new stadium at the outskirts of St. John's has been built and is named Sir Vivian Richards Stadium. Soccer and basketball are also increasing in popularity. Famous athletes are Sonia Williams and Heather Samuel who have represented Antigua at the Olympic Games. Other athletes to watch are Janill Williams, Brendan Christian (100 m, 200 m), Daniel Bailey (100 m, 200 m) and James Grayman (High Jump). Raggae and Zouk (a rythmic music that originated in Martinique and Guadeloupe in the 1980s) are both popular on the islands. Calypso and soca are also two other popular expressions of local music. The roots of the genre lay in the arrival of African slaves, who, not being allowed to speak with each other, communicated through song. Soca is also a singing style like calypso, but is much more rhythmic and soulful. The most popular of all is a style of music called Steel-pan (steel-drum), originated in Trinidad. It is a melodic percussion music that comes from tapping oil drums. It is an integral part of the Annual Carnival and the Christmas festivities. ↑ 1.0 1.1 1.2 1.3 Antigua and Barbuda. International Monetary Fund. Retrieved 2011-04-12. ↑ St. John's: Antigua, St. John's. Retrieved July 29, 2007. ↑ Museum of Antigua and Barbuda, Prehistory. Retrieved August 18, 2007. Callo, Joseph F. 2001. Nelson Speaks: Admiral Lord Nelson and His Own Words. Naval Institute press. ISBN 1557501998. Harlow, Vincent T. Christopher Codrington. London: Palgrave McMillan. ISBN 0312048416. Olsen, Fred. 1974. Indian Creek: Arawak Site on Antigua, West Indies: 1973 Excavations by Yale University and the Antigua Archeological Society. Norman: University of Oklahoma Press. ISBN 0806112077. Philpott, Don. 2004. Landmark Visitors Guide Antigua and Barbuda. Landmark Publishing. ISBN 1843060612. Government of Antigua and Barbuda. The Official Website of the Government of Antigua and Barbuda. The High Commission of Antigua and Barbuda London. Antigua and Barbuda. American University of Antigua College of Medicine. American University of Antigua College of Medicine. American University of Antigua College of Medicine. AUA College of Medicine's Health Sciences Library. History of "Antigua and Barbuda"
This page was last modified on 5 April 2016, at 15:13.